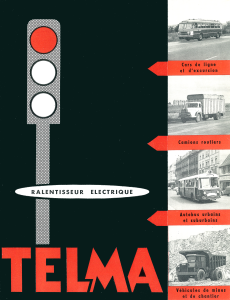 Freins Electromagnétiques - Historique - Telma S.A. 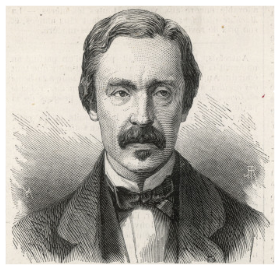 Discovery of the currents induced in the variation of the magnetic flux through a metallic mass by Jean Bernard Léon Foucault. The currents that have since carried his name. Steckel filed the first retarder patent using Foucault current. Appearance in France of the first applications of Foucault current on vehicles, built on the principle of a central single induced disk. 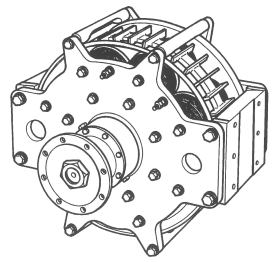 This device was designed by the French engineer, Raoul Roland Raymond Sarazin. 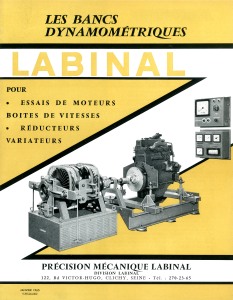 The ELMA "ELectro-Mécanique de l'Aveyron" Company, owned by the French group Labinal, acquired an exclusive licence for Raoul Sarazin’s patent. ELMA begins a process of continuous improvement of Foucault current retarders; a process which allows it to file patents for improvement, from its launch. The ELMA company production workshops are on rue Severac, in Rodez, Aveyron, and the head office is at 84 avenue des Champs Elysées in Paris. The range of retarders is enriched with the 360 and 510 models that allow for the equipping of vehicles of 4 to 32 tonnes of gross vehicle weight (GVW). In March, the “Sud-Est Industriel et Commercial” magazine published an article entitled “The terrible descent of Laffrey defeated without danger”. This article describes the test throughout the 7 km Laffrey descent with a 8.3 tonne truck equipped with a ELMA retarder and carrying 12 tonnes of coal. The descent of Laffrey then held the record of the French road with the highest slope, with an average of 14% and a stretch at 17%. The article concludes with the exceptional benefits of the ELMA retarder in terms of safety. Indeed, the ELMA allowed a truck to run the 7 km descent in 15 minutes, at a maximum speed of 50 km/h, without any use of friction braking systems. ELMA, with its parent company Labinal, markets a complete range of testing benches for engines designed for gas stations for vehicles. The exclusive rights of use by the ELMA Company of Raoul Sarazin’s patent is officially recognized by court decision dated 23rd April. The head office was transferred to the 7bd Malesherbes in Paris 8eme. The desire to perfect the electromagnetic retarder led ELMA to focus its research efforts on the improvement of the dissipation of calories generated during the operation of the retarder. In this manner the retarders of the 15000 range induced double disk appeared. On 29th June, by decision of the Extraordinary General Meeting of shareholders, the Electro Mécanique Company of Aveyron changed its name to TELMA Company. 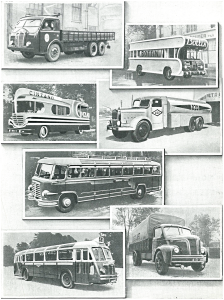 By order of 17th July, the French public authorities required the use of a retarder on all vehicles transporting passengers of more than 8 tonnes of GVW (gross vehicle weight) in areas declared difficult and rugged, the list was detailed by a ministerial circular of 11th June 1957. From 12th to 17th of September, the TECHNICAL AUTOMOBILE and CYCLE UNION began trials on the Mont Ventoux with a vehicle equipped with a TELMA retarder. The TELMA Company, thanks to its continuous commitment to improve the retarder principle, the "Sarazin" central induced disk, created the first TELMA retarder with two outer induced disks, invented and produced by engineer Gilbert Lamarque, among which the inductor system is prepared with two crowns of electromagnets. This revolutionary construction, which would be immediately protected by patents filed both in France and abroad, which since has been widely used by the world of electromagnetic braking. The TELMA retarders of the C series, based on this concept, were then marketed. In June, the magazine AUTOMOBIL TECHNISCHE ZEITSCHRIFT (ATZ) published a study made at the request of the Minister of Transport of the Federal Republic of Germany as part of a campaign to increase the safety of road traffic. According to this study, only the TELMA retarder using Foucault currents could be considered as a usable retarder in practice. The registered office was transferred to 14 rue Daviel, Paris 13eme. Convinced of the importance of the TELMA retarder in the field of road safety, the French insurance companies granted a reduction in premium for vehicles equipped with a TELMA retarder. The TELMA retarder would no more count in the GVW (gross vehicle weight) allowed by the French Administration of Mines, which demonstrates the great interest the administration had in using the retarder to increase the safety of heavy loads. The distribution network, already in place in France, had been widely extended to the majority of European countries. Roger Gerber’s work "The AUTOMOBILE", referring to that time, mentions only the TELMA retarder as being usable in practice. Creation of the German subsidiary BFH (Bremsen und Filter Handelsgesellschaft), in Schmiden, near Stuttgart, responsible for distribution and technical assistance for Germany. Also, at the end of the 1950s, the English subsidiary, TRL (TELMA Retarder Ltd), in London, was created, responsible for distribution and technical assistance for the United Kingdom. 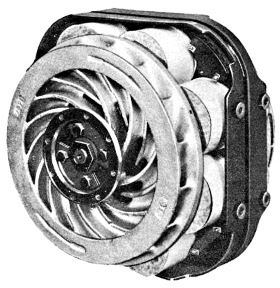 Continuing its research efforts on the improvement of the dissipation of generated calories during the operation of the retarder, TELMA marketed an evolution of its entire range which would now be equipped with rotors with curved fins and ventilation channels, thus improving heat dissipation while decreasing aerodynamic drag. The TECHNICAL AUTOMOBILE and CYCLE UNION organised a lecture followed by a discussion on retarders. With regard to electrical retarders, only the TELMA retarder was presented. In January, the Spanish Minister of Industry declared the TELMA retarder for trucks and buses of public utility. In October, the head office moved to 2 rue Louis Champion, Bezons, in the Paris region. That year, the activities of the Rodez plant moved to the Vire site in Normandy. The extraordinary success of the French company TELMA in the area of retarders exported worldwide and built under licence in Spain, prompted a large number of foreign manufacturers to more or less slavishly copy TELMA retarders. These unscrupulous industrialists were not merely content in diffusing their counterfeit retarders in their country of origin, but also in France and abroad. 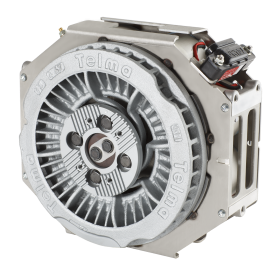 TELMA launches the "Focal ®" retarder, a revolutionary concept intended to equip the gear boxes and axles. 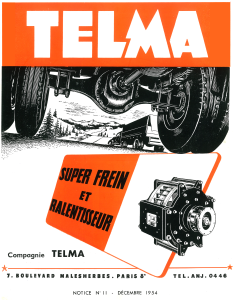 TELMA developed the Focal ® retarder, which authorizes mounting on drive shaft vehicles to equip rear engine vehicles for the French manufacturers Saviem and Berliet. 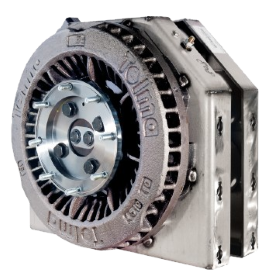 This concept quickly attracted the market and especially manufacturers of gearboxes, which validated the mounting of TELMA Focal ® retarders on their products. 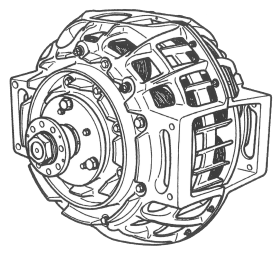 The first solutions were marketed by ZF Friedrichshafen for its AK/S6-70 ranges, followed by many adaptations on gearboxes for industrial tractors. The manufacturing of retarders left the factory in Vire for Clichy avenue, in Saint-Ouen, Paris region. In April, the Spanish subsidiary, MATELI S.A. was created, intended to meet the needs of the Iberian Peninsula with a factory on the outskirts of Pamplona and a distribution and technical assistance centre based in Madrid. The CA range was also introduced in 1968. Victim of its growing success, TELMA was forced to protect the interests of the market of electromagnetic retarders, to engage in the fight against the marketing of counterfeit retarders. On 2nd April 1968, the Spanish company KLAM was condemned by the Court of First Instance of PARIS for slavish copying of the Compagnie Française TELMA. 3rd December 1971, the Spanish company SUPERFRENOS ELÉCTRICOS was condemned by the Commercial Court of AVIGNON for unfair competition against the Compagnie Française TELMA. On 13th January 1972, by judgment of the PARIS Court of Appeal affirming a judgment of the Court of First Instance of PARIS dated 4th February 1971, the Spanish company SUPERFRENOS ELÉCTRICOS was sentenced for unfair competition and an attack on the literary and artistic property of the Compagnie Française TELMA. On 3rd July 1972, by judgment of the Court of Appeal of PARIS, affirming a judgment of the Court of First Instance of PARIS dated 14th May 1971, the Spanish company SUPERFRENOS ELÉCTRICOS was ordered to pay damages to the Compagnie Française TELMA and the French Patent No. 1,582,167 filed by SUPERFRENOS ELÉCTRICOS was cancelled. 1st December 1972, by judgment of the PARIS Court of Appeal affirming the judgment of the Court of First Instance of PARIS on 16th October 1971, the Spanish company FRENOS IRUÑA was again sentenced for unfair procedures against the Compagnie Française TELMA and the French Patent No. 1,434,246 filed by FRENOS IRUÑA was cancelled. On 31st March 1973, by judgment of the PARIS Court of Appeal affirming a judgment of the Court of First Instance of PARIS dated 9th February 1972, the Spanish company FRENOS IRUÑA was condemned for infringement of four patents and French certificates of addition operated by the Compagnie Française TELMA. 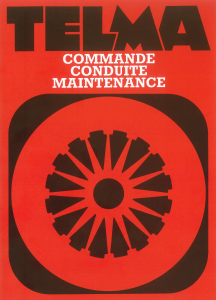 On 9th April 1974, the Spanish company FRENOS IRUÑA was condemned by the Court of First Instance of PARIS for infringement of five French patents operated by the Compagnie Française TELMA. On 25th June 1974, the Spanish company ONECA S.A. was condemned by the Court of First Instance of PARIS for counterfeiting and unfair competition against the Compagnie Française TELMA. The first Focal model mounted in series was the Focal 115 requested by the manufacturer SAVIEM to equip its E7 rear-engine coach. In the market of the axle-retarder, EUROTELMA was appointed to equip trailers and semi-trailers in cooperation with the company EUROPE TRANSMISSION. The registered office moved to 89 Avenue du 18 Juin 1940, in Rueil-Malmaison, near Paris. The Focal retarder, offering an indispensable solution for rear engine coaches, made a remarkable breakthrough on the German OEM market. 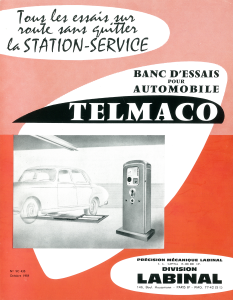 TELMA marketed, on the J7 utility of the Peugeot brand, its first hydraulic retarder. 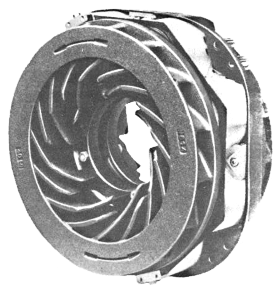 The Telmatic was a water turbine that used coolant from the vehicle. 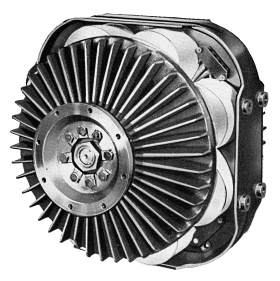 Located inline with the crankshaft, it was a primary retarder which strengthened the engine brake; it delivered a nominal 150 NM, overdrive by the engaged gearbox ratio. 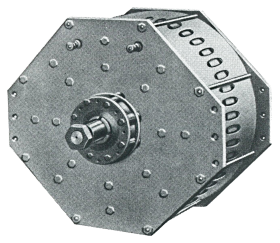 That same year, the BOSCH company decided to abandon its electromagnetic flange retarder project because of the refusal of TELMA to grant them the necessary licenses. TELMA sold more than 1000 Telmatic hydraulic retarders. In December, the head office and production plant were grouped on the current site of Saint-Ouen L’Aumône in the Paris region. Launch of the CC65, CC80 and CC300. During the construction of the Nice airport, partly from the sea, 80 BERLIET 6x4 trucks equipped with the TELMA CA200 retarder, took turns in carrying backfill to this very large construction site. 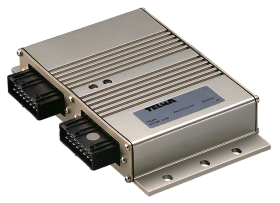 TELMA continued the integration process of its Focal type retarders, which the new F300 model, in partnership with the major stakeholders in the market of gearboxes. A few examples: ZF “Ecosplit”, RENAULT V.I. “B9/B18”, EATON “Fuller”, SCANIA “GR870T”, MERCEDES-BENZ ”G4”. Creation of a commercial antenna in Tokyo, Japan, for the far East market. Launch of the model: CC100. 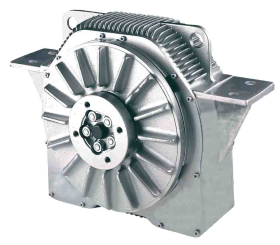 TELMA introduced a major innovation that allowed, by optimizing the generation of Foucault current, an improvement of the torque by 10%, without having impact on power consumption or the weight of the retarder. This TELMA innovation was called RIC technology (Reaction of Compensated Reaction). Creation of the American subsidiary TELMA Retarder Inc., which settled at first in Cleveland, Ohio for six months and was then settled in Hayward (California). The latter was responsible for distribution and technical support in North America. Launch of the Focal 3000 and 3300 which integrated the RIC technology and a new generation of rotors. TELMA launched a communication campaign illustrated by the famous French "humanist” Designer PIEM. Exhaust brake interface, reference JC322100: module enabling the control of the exhaust brake, in function with the engine brake and the link to the TELMA retarder. Creation of the subsidiary TELMA Retarder Italia in Milan. TELMA logo adopted the colour "blue" from the Labinal group. 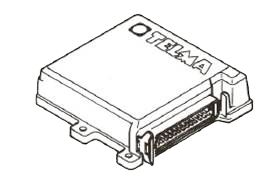 In June, TELMA presented the Retarder concept called "M” and launched the model M3300. TELMA marketed the Focal FN50-85 retarder which had equivalent performance, a 25% size reduction compared to the FV60-90 model. Evolution of the logo and name change to TELMA SA on 15th November. Presentation of the Hydral concept at the IAA in Germany: first water cooled electromagnetic retarder, producing the electrical power it consumes. Creation of the Mexican subsidiary, TELMA RETARDER DO MÉXICO, for the marketing of retarders in the Mexican market. TELMA marketed in Brazil, the first Focal retarders of the FL range, studied specially to equip rear engine coaches. They presented a solution that is shorter than the standard Focal range, by the absence of additional antifriction bearing. The MCR references JC372100/200/303/302/305/306/307 and 310 were developed and mounted on trucks from RENAULT Commercial Vehicles. 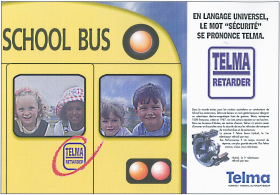 In 1998 Telma decided to give new names to its family of retarders. Road tests on MERCEDES-BENZ trucks, first Hydral retarders adapted for use in series. Integration in the VALEO group, Electrical Systems branch. 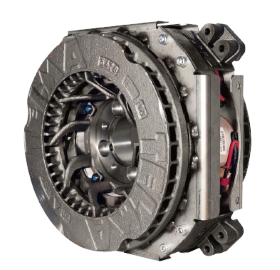 The MCR reference JC372315 was developed and mounted on EvoBus vehicles ( for the brands: MERCEDES-BENZ and Setra). The MCR reference JC372311 was developed and mounted on RENAULT VI trucks. TELMA marketed the FN82-40, especially studied at the request of IRISBUS. The FN82-40 presented a mass less than 30kg FN72-40 for the same torque. New plant in the Shanghai area which aimed at supplying the Chinese market. The Chinese plant manufactures, under the company license of TELMA SA, part of the Focal range adapted to the needs of the Chinese market. The MCR reference JC372319 is developed and mounted on RENAULT Trucks, references MC002016/033 on IRISBUS buses, the reference MC001020 for IVECO Daily minibuses. The MCR reference MC002019 is developed and mounted on VDL buses, while the MC001024 reference was created for IVECO minibuses. In September, all of the companies forming the TELMA Group were repurchased from the Valeo Group, by Torque Industry. On the occasion of this change, the TELMA brand adopted a new logo. TELMA launches the FM range. This latest generation of Focal type retarders, fruit of the indisputable TELMA experience in the field, introduced many improvements. The size 6, first to form this new family, was specially developed for the Chinese market. TELMA launches the AF range. This new generation of retarders, of the axial type, concentrated all the latest technical innovations of Telma, resulting from TELMA’s undisputed expertise in the field of retarders. Sizes 3 and 5 were the first to form this new family. Size 2, meanwhile, came in December.